Getting in game currency couldn't be easier. One of the most challenging things to do in any mobile game is earn in-game currency, especially in Angry Bird Epic, Rovio's first RPG featuring the iconic Angry Birds characters as legendary heroes. If you're new to the game, we strongly suggest that you check out our beginner's guide to get started. In this guide, we'll help you get Lucky Coins, Snoutlings and Essence of Friendship to purchase items, blueprints and power up weapons to get through the game. What are Lucky Coins and how are they used in Angry Bird Epic? 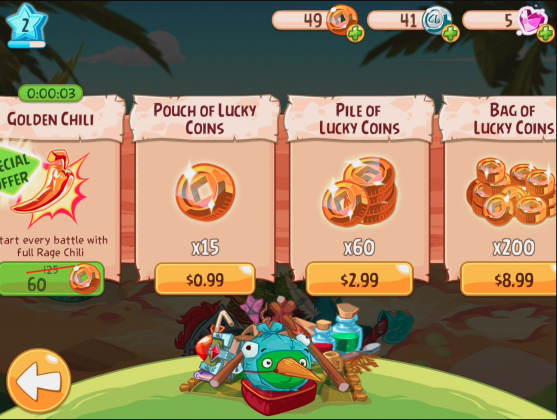 Angry Bird Epic uses Lucky Coins to purchase specialized items like Golden Chili, Experience Potion and Mighty Eagle's Favorite Dish. Lucky Coins can also be used to upgrade in-game items like the Magic Anvil and Cauldron. Upgrading these Magic items enables you to roll at least one star when crafting items and weapons. Use Lucky coins to Roll for legendary items; these items cost three or 20 coins, and increase in rarity depending on the spend. How do I get more Lucky Coins in Angry Birds Epic? Lucky Coins aren't easy to come by in the game, and there are very fews way you can get them for free. As you level up within the game you receive one Lucky Coin per level. You can win Lucky Coins with a daily bout on the Golden Clouds. Beat the Golden Pig machine with three stars to increase your chance of obtaining the chest. Win the chest, get ingredients and a chance to score a Lucky Coin. Playing daily and beating the Golden Pig increases your Lucky Coin reward. Another way to score some Lucky Coins is to work with friends via Facebook to unlock gates to treasure chests throughout Piggy Island, which may have a few Lucky Coins. If you're in the middle of a heated battle, use Lucky Coins to turn the tide to instantly purchase items to replenish energy and the Chili Rage Meter. In the event you run out of Lucky Coins, go to the in-game store and purchase some. The cost ranges from $0.99 for 15 to $89.99 for 3,000. What are Snoutlings and how are they used in Angry Bird Epic? Angry Bird Epic uses Snoutlings to purchase ingredients, blueprints to build potions for off-hand items and weapons. Snoutlings can also be used to purchase items to replenish energy and the Chili Rage Meter prior to a battle at the nest. How do I get more Snoutlings in Angry Birds Epic? Unlike Lucky Coins, Snoutlings are easier to come by in the game. You can win Snoutlings with every battle on Piggy Island. Snoutlings are even given to you as a consolation prize when you lose. You can win Snoutlings with a daily bout on the Golden Clouds. Beat the Golden Pig machine with three stars to increase your chance to earn more Snoutlings. Playing daily and beating the Golden Pig increases your Snoutling reward. You can also purchase Snoutlings with Lucky Coins, and the cost ranges from 20 Lucky Coins for 250 to 1,000 Lucky Coins for 17,500. What is Lesser Essence of Friendship and how is it used in Angry Bird Epic? Angry Bird Epic uses Lesser Essence of Friendship to increase your chances to roll for more stars on the die to power-up off-hand items and weapons. How do I get more Lesser Essence of Friendship in Angry Birds Epic? Get your friends involved. Connect with FaceBook and visit the Totem pole to earn your daily Lesser Essence of Friendship reward. The more friends you have playing, the greater the reward, as you can collect Lesser Essence of Friendship daily from each friend. You can also purchase Lesser Essence of Friendship with Lucky Coins; the cost ranges from 50 Lucky Coins for 10 to 100 Lucky Coins for 25. You now have a few tips and strategies for getting in game currency in Angry Birds Epic. Don't let your eggs get scrambled and remember to like us on Facebook, so we can team up to stop King Pig. If you have any tips and strategies for getting more Lucky Coins, Snoutlings, Essence of Friendship that we overlooked, feel free to comment below.